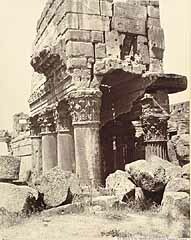 Thru a Distant Lens, a special exhibit of vintage 19th c. photographs of Europe, the Middle East, and the Orient, from the well-known collection of Dr. Daniel Tassel, opens on Sunday, November 9, with a reception from 2-5pm, at which the collector will be present. The exhibit will continue through December 14, 2003. The exhibit features original albumen prints from glass plate negatives by famous 19th century photographers, including Frith, Frank Mason Good, Bonfils, Beato, Bourne and Scowen. The prints are part of a larger collection that is noted for the excellent quality of each print. Photographs from Dr. Tassel's acquisitions, collected over a period of two decades, are included in the collections of Harvard's Fogg Museum and Fine Arts Library, the DeCordova Museum, the Worcester Museum, the Israel Museum in Jerusalem, and the Tel Aviv Museum. A number of photographs from the collection were exhibited in the recent Fogg Art Museum show, "Sight-seeing: Photography of the Middle East and its Audiences." Dr. Tassel became interested in collecting important vintage 19th century photographs when he traveled to Israel in the early 1980's, and became involved in a re-photography project, utilizing some of the same images from the 19th century while photographing various sites from the same vantage point. Some of his own photographs are in the Jewish Museum and the International Center of Photography, in New York City. Thru a Distant Lens continues through December 14, 2003. Gallery hours are flexible, and by appointment. For more information, please call 617-332-7495 or 617-504-7596, or visit www.kantarfinearts.com. The gallery is open by appointment. We are located at 382 Kenrick Street, Newton MA, off Waverley Avenue, about one mile from the Mass Pike. An Englishman, Good traveled to the Near East during several trips in the mid-1860’s and early 1870’s. His images were exposed on glass plate negatives, using the wet collodion process, printed on albumen paper, and then gold toned. His unique work often made use of a second negative to include a credible sky. A number of Good’s photos were marketed by Francis Frith, in the Frith Series, have an accompanying biblical quote, and are unsigned. Many of his remarkable images are signed F.M. Good or FMG in a monogram on the glass plate negative. Good’s views are beautifully composed. They often include natives and tourists, adding a touch of charm to the scene. He is considered by many collectors and historians to be the best of the 19th c. Near East photographers. Francis Frith arrived in Egypt in September 1856 to photograph its ancient monuments and exotic sites. Over the next several years, he returned twice to Egypt and Nubia and also traveled to Palestine, capturing on his glass plate negatives the places depicted in the Holy Bible. Well composed and printed on fine albumen coated paper, his images were widely acclaimed and tremendously popular. Frith founded a major photographic business and hired photographers, including Frank Mason Good, to record the Near East and Europe for his eager public. Frith’s prints are in every major private and museum collection of the 19th century Near East photography. Antonio Beato opened his photographic studio and business in Cairo in 1862. He used the glass plate wet collodion process negative, and printed his views on thin paper coated with egg white (albumen). Until almost thirty years later, and the introduction of the first Kodak camera, tourists were unable to snap their own pictures, and eagerly sought out Beato’s architectural, landscape and genre scenes. These were the postcards of the 19th century. At home, these images were often pasted in an album, and provided, for family and friends, a detailed tour of an exotic adventure. Antonio Beato prints of this quality are rarely, if ever, seen, even in museum collections. Georgio Sommer, a German-born photographer, officially began his career with the opening of his studio in Naples in 1857. Within several years, he had formed a partnership with Edmondo Behles. Sommer photographed widely throughout Italy and Sicily and surrounding countries, was highly acclaimed, and was appointed photographer to King Victor Emmanuel. His images range from the documentation of ancient archeological sites to whimsical views of locals engaged in everyday life. 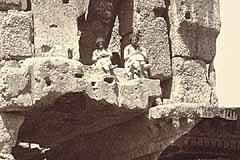 Sommer’s excellent photographs remarkably document 19th century Italy and Sicily. Felix Bonfils and his wife, Marie-Lydie, moved from Languedoc and set up their studio in Beirut, Lebanon, in 1867, starting the most successful photographic business in the Near East. After the death of Felix in 1885, his son, Adrien, and his wife, Lydie, continued the business into the early 20th century. Gold toning frequently added a richness to the range of tones produced by their glass plate negatives and fine albumen prints. Their views included ancient monuments, biblical sites, genre scenes, and a number of posed studio images, the latter often tinged with a bit of humor. Despite their huge production, many of their images are unique and show the changing landscape over a period of several decades. Charles T. Scowen arrived in Ceylon in the early 1870’s, and within several years, opened his very successful photographic studio and business. Scowen’s startling images of this distant land capture expansive landscapes as well as the innate beauty of its exotic botanical specimens. The native population is seen at work and at home in his luminous prints. These photographs by Scowen are in major collections, including the Boston Museum of Fine Arts, the Getty Museum, and the New York Metropolitan Museum. Samuel Bourne began photographing in his late teens in the Midlands of England. An adventurer, keen observer, gifted writer, and meticulous craftsman, his talent was recognized at an early age. By 1963, at age 29, he was photographing throughout India. He soon founded a successful partnership with Shepard (Bourne & Shepard), which continued until his return to England in 1869. His luminous prints record a remarkable Indian landscape.